In his book "Black Holes and Time Warps," astrophysicist Kip Thorne opened a door for non-scientists to enter the world of twisted space. There are books we love and books we hate, and then there are books that irrevocably change our lives; for me, that book is "Black Holes and Time Warps" by Kip Thorne. I first heard the name Kip Thorne during my third year working on an undergraduate degree in physics, when my friend Dan gave me a beat-up paperback copy of Thorne's book, "Black Holes and Time Warps: Einstein's Outrageous Legacy." Neither Dan nor I can recall if it was intended as a gift or just a loan, but I still have it; it's sitting on my desk, not so much for technical reference but as a reminder of why I do what I do. But when I cracked open "Black Holes and Time Warps," the joy that had made me pursue science in the first place came back to me. "Black Holes and Time Warps" is a book about the history and science of black holes. It dives into what scientists know about power of gravity, the nature of space-time and the possibility of worm holes; it touches on Einstein's theory of special relativity and some particle physics, among other things. There's not a lot of math in the book, but it's still heavy on the science and it is not what I would describe as a "light read." I think it presents a fantastically in-depth but manageable answer to the question "What is a black hole?" Leading the reader on this awesome journey is theoretical astrophysicist Kip Thorne, who during his career was considered a world authority on black holes and other strange topics in astrophysics. I can't imagine having a better teacher on this subject than Thorne. He's a master of the scientific minutia and thoughtful about the big picture. I always got the impression that while he clearly knew more about black holes than I ever would, we shared the same fundamental curiosity about the universe, and on that level we could be equals. And of course, there's the awesome fact that Thorne loves weird science. For example, he published scientific papers on the physical possibility of time travel, which wasn't always considered a serious avenue of investigation. (By the way: Backward time travel is probably impossible, and things are still murky when it comes to forward time travel, but scientists know for sure that time moves differently for different observers, so in that sense we are all traveling in time relative to each other). Thorne also showed me (and, I hope, many people) that writing for a general, non-scientific audience was not beneath one of the greatest astrophysicists in the world. There is an idea held by some people in the physics community that a scientist who engages with the public produces inferior science (and data points like Thorne, Stephen Hawking, Richard Feynman, Neil deGrasse Tyson, Carl Sagan, Lisa Randall, Sean Carroll and the many, many other highly talented scientists engaging the public in new and exciting ways, are apparently not enough to eliminate this notion). It's an idea that is not only harmful to those who would like to engage the public, but to the entire community, for many reasons. Thorne set the example that engaging the public is a worthwhile activity for a scientist. I didn't know it at the time, but this book was planting the idea in my mind that telling stories like this one was exactly what I wanted to do. By the time graduation rolled around, I'd found science writing and was relieved and excited to know that science was going to be a part of my life after all. 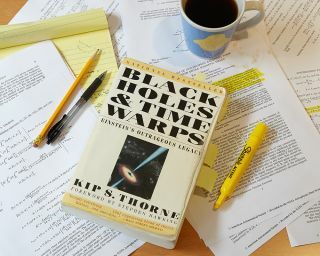 Last year, for the 20th anniversary of "Black Holes and Time Warps," (and not quite a decade after Dan handed me that paper tome), I had the opportunity to interview Thorne about the book. It took some personal restraint not to completely nerd-out on him. I asked Thorne why he had decided, back then, to write a book for non-scientists. He said when he was 13 years old, he read the book "One Two Three … Infinity" by George Gamow, a very talented nuclear and astrophysicist who worked during the first half of the 20th century. "That book inspired me to become a theoretical physicist," Thorne said. "It had more impact on me than anything in my youth. And I would like to return that to the next generation." Looking back at the way Thorne's book affected me, this intention is so incredibly clear. I didn't end up becoming a scientist, but in part, because of this book, I kept science in my life. There will always be young people who need their love of science awakened. There need to be scientists from this generation who take up the torch that Gamow and Thorne carried. "It's partly an issue of trying to generate interest among young people in science, so that at least some of the most brilliant young people still turn to science, when they might otherwise go into the financial world, for example. "It's also a deep feeling that it's terribly important for the general public to understand science, to understand not necessarily the details of science and how black holes work, but rather the scientific method; the difference between well-established scientific fact, which includes climate change and evolution, and things which are speculative. And an appreciation for the power of science to deal with the problems that society faces, such as climate change, such as the Ebola virus and other viruses which evolve over time and you have to deal with the science of evolution in order to deal with them in the long haul. "We have huge problems that face the human race, particularly when you think in time scales of decades and centuries. And science really is an extremely powerful force for solving them. And I would hope that the books that I've written may have some role in educating the public about the power of science for dealing with these kinds of things." So what book changed your life?